Eco cup brand GoReusable.Org launches "THIS CUP PLANTS ONE TREE" cup in partnership with the National Forest Foundation. Eco cup brand GoReusable.Org has just taken the sustainability of its products a step further by signing a deal with US charity National Forest Foundation (NFF). The packaging of their next batch of cups will be labelled, "THIS CUPS PLANTS ONE TREE," because for each cup purchased, a tree will be planted in an area of degraded forest. 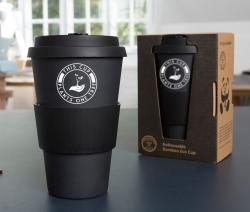 Weybridge, United Kingdom, April 04, 2019 --(PR.com)-- Eco cup brand GoReusable.Org launches "THIS CUP PLANTS ONE TREE" cup in partnership with the National Forest Foundation. Eco cup brand GoReusable has just taken the sustainability of its products a step further by signing a deal with US charity National Forest Foundation (NFF). The packaging of their next batch of cups will be labelled, "THIS CUPS PLANTS ONE TREE," because for each cup purchased, a tree will be planted in an area of degraded forest. Like all eco cups, GoReusable’s are fundamentally good for the environment as they reduce dependence on single use cups, which are posing a growing hazard, especially to ocean life. They’re made from a composite material based on bamboo fibre. Bamboo itself is a highly sustainable material as it’s fast growing with no need for irrigation or the addition of any chemicals, and it’s rapidly renewable. The cups are designed to be long lasting, however if they do get damaged, they’re biodegradable. At the moment, "THIS CUP PLANTS ONE TREE" cups are only available for retailers to pre-order. This is an ideal opportunity for businesses that are serious about showing they care about the environment. The options include plain wholesale or branded cups. Buyers interested in pre-ordering should email Edward and his team at info@goreusable.org. Launched in 2018, GoReusable was inspired by the pressing need to reduce the world’s dependency on single-use cups – an estimated 500 billion disposable cups are made and discarded globally each year. GoReusable Bamboo Eco Cups are made from bamboo fibre which is a bi-product of chopstick manufacturing and are biodegradable, minimising their impact on the environment. They are available for consumers to purchase directly through the website or for organisations to buy in bulk, either wholesale or branded. The National Forest Foundation (NFF) is a registered non-profit charity based in the United States. Chartered by Congress, it was created with a simple mission: engage the public in community-based and national programs that promote the health and public enjoyment of the 193-million-acre National Forest System, and administer private gifts of funds and land for the benefit of the National Forests.